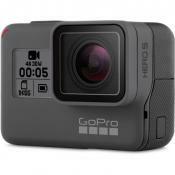 HERO4 GoPro action camera shoots the videos in the best quality, while sound recording is also superb thanks to a powerful audio system. 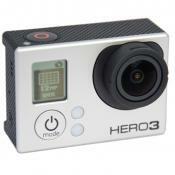 This best GoPro camera comes with lots of mounts for all kinds of sports. 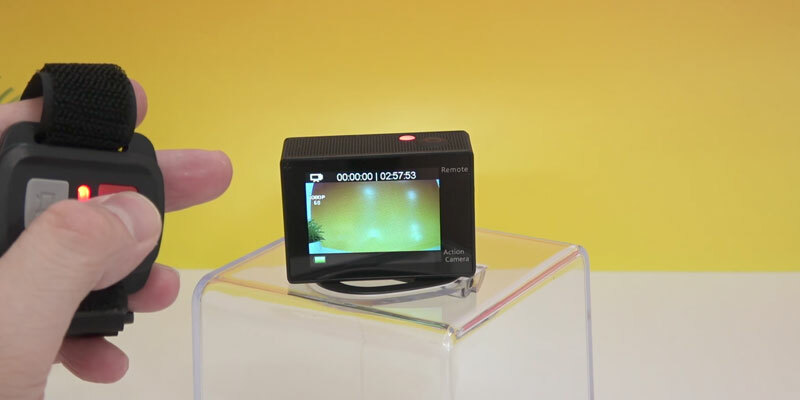 The gadget can record Ultra HD videos and the maximum shooting speed reaching 240 FPS. Wireless control option is available owing to built-in WiFi. 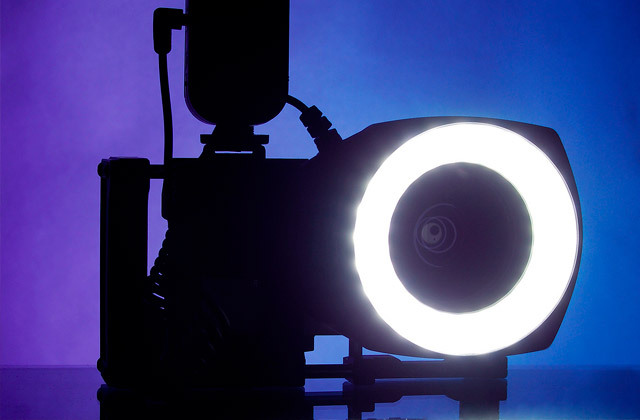 Watching videos you shoot is possible on an LCD display or mobile devices only. 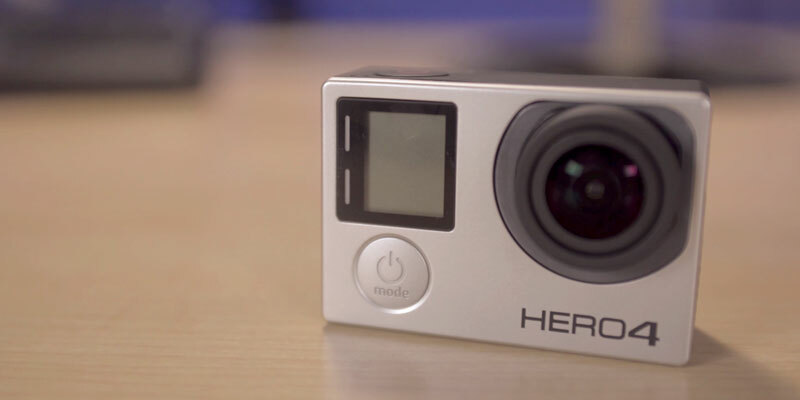 HERO4 GoPro is the best action camera, which is, no doubt, second to none in terms of performance and features. No matter what kind of extreme sports you do - biking, parachuting, surfing, and so on. 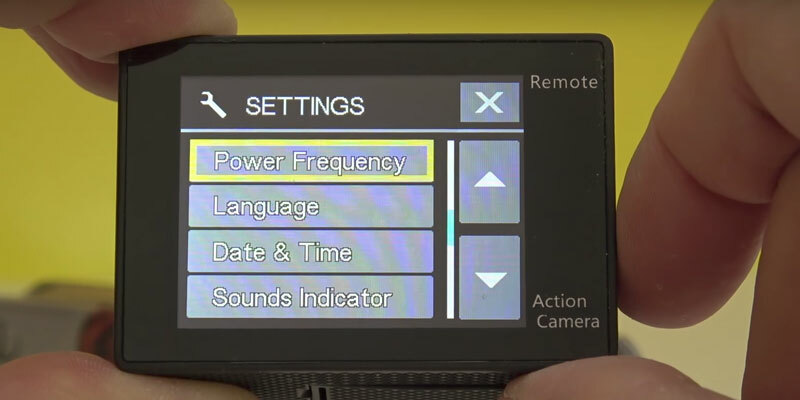 The AKASO EK7000 comes with a wireless wrist remote control. Therefore, the navigation is much simpler and faster. There are also enough mounting accessories for more convenient installation. The FPS for 4K recording is rather low. That is an outstanding camera that was given a low price and high-quality. AKASO is compatible with most of the GoPro mounts. Besides, not only will it give you high-quality videos it is also super easy to control. The Campark ACT74 takes 16MP photos, so you can also apply it as a photo camera. Plus, it comes with an ergonomic portable case and accessories for handier use. Angle view of a built-in display is not very wide. Would you like to make highly detailed and clear videos in 4K resolution with 30 fps? Campark will perfectly help you with that. And will make it for a reasonable price. This model isn't suitable for diving or surfing. Stoga action camera is not only one of the smallest models on the market, it also has quite good shooting parameters. With handy mount accessories, it is convenient to install on your helmet, bike/motorbike, or car. 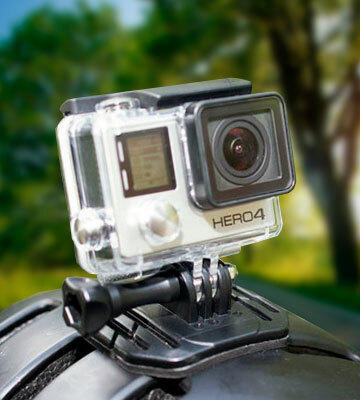 GoPro HERO4 is an HD action camera that boasts stunning video and photo shooting features. 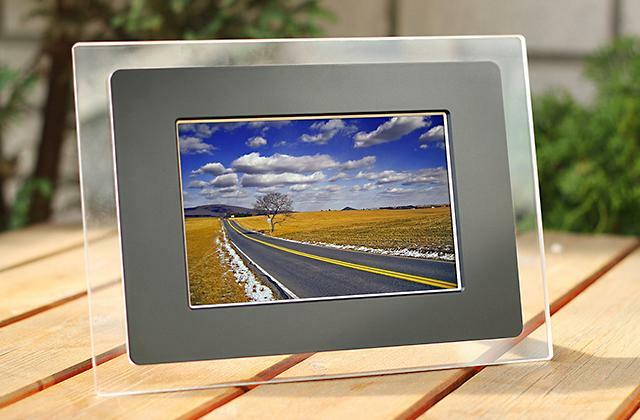 The gadget ensures excellent image quality even in the most extreme conditions. You can configure the resolution of videos and change the FPS rate. 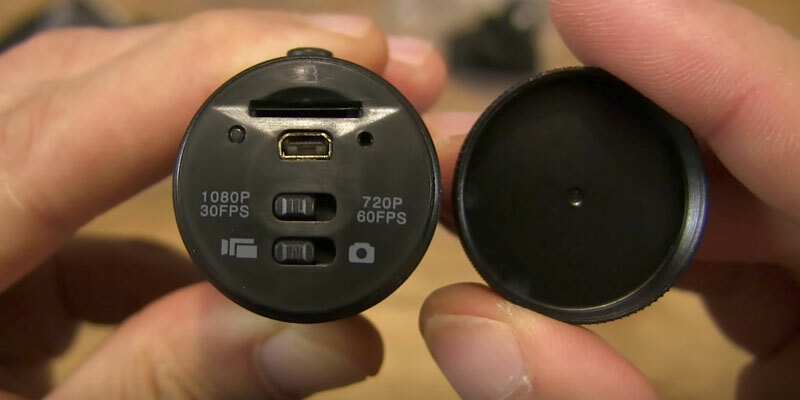 Unlike many other action cameras, GoPro HERO4 can shoot 4K videos (3840 x 2160 pixels) at 25 FPS. Of course, Full HD is supported too - the camera shoots 1920 x 1080-pixel videos at a huge FPS rate of 120! 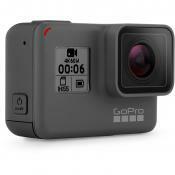 GoPro is the leading appliance among its counterparts due to other amazing features: there's a Time Lapse mode for shooting videos at a regular interval (from 0.5 to 60 seconds). 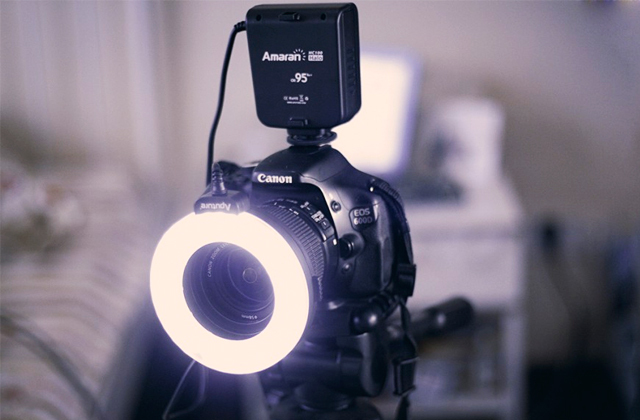 This feature allows you to shoot awesome slow-motion videos. Also, there's a Burst mode for capturing a sequence of pictures. 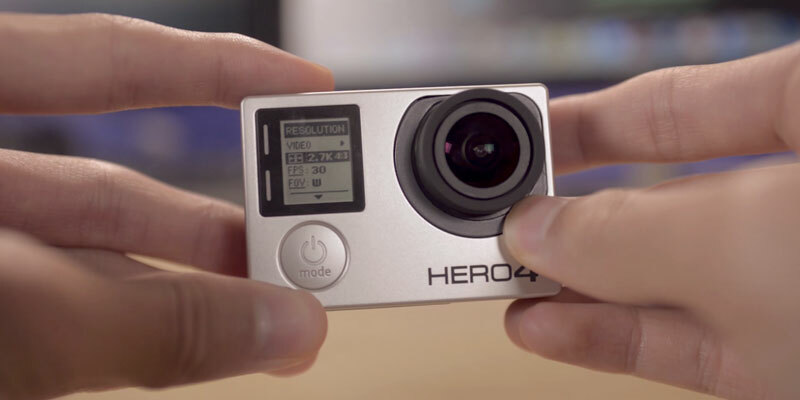 GoPro HERO4 action camera has a built-in WiFi connectivity, so you can easily control the unit wirelessly right from your smartphone or tablet. 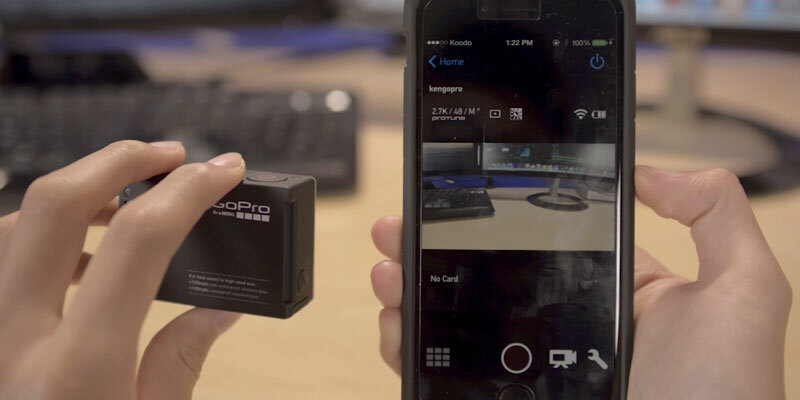 There's a special GoPro app for that, and it has versions for the most popular operating systems like Android, Windows Phone, and iOS. With that app installed, you can configure all settings of HERO4 HD action camera. This model comes with lots of accessories that allow you to shoot videos and photos even during the most extreme, daredevil activities. 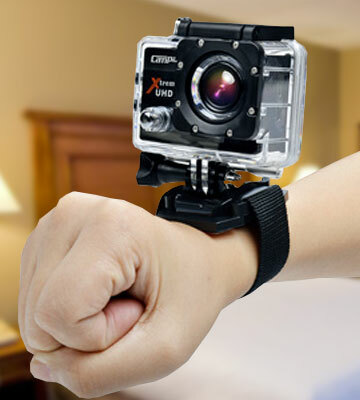 This device is certainly a winner of all GoPro reviews! This awesome GoPro model is surely one of the best action cameras available. The unit looks like a photo camera: there's an informative monochrome display (however, it isn't backlit). 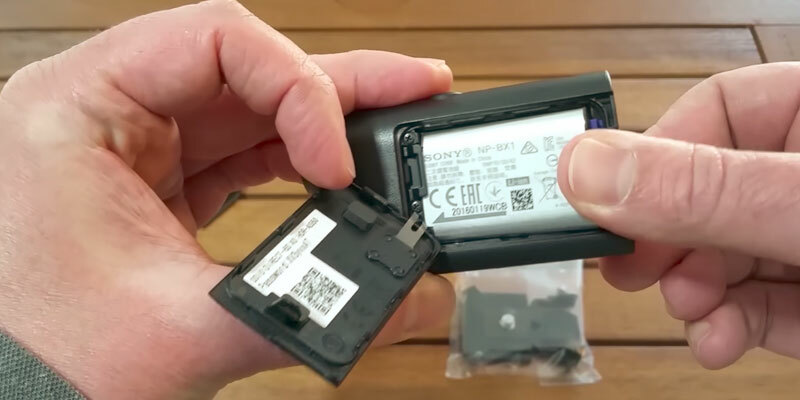 The battery slot is on the back side of the unit - the battery is removable, so you can quickly replace it. You can configure the camera with the help of 3 buttons on the housing (on top, on one side, and on the front part of the camera), but you can also do it right from an Android-based smartphone or tablet. 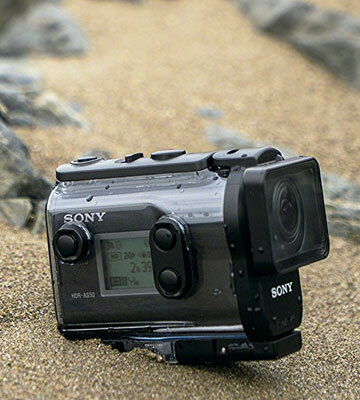 The unit itself isn't waterproof, so you must use a waterproof case for shooting underwater videos (maximum depth is 40 meters). If you require more controls, you can plug a touchscreen to the unit. 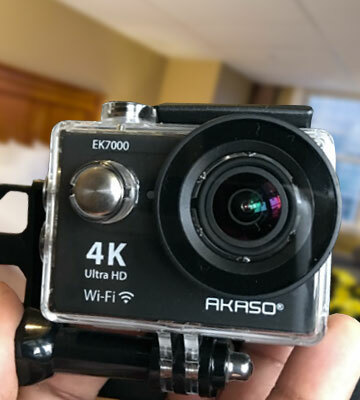 The Akaso EK7000 has features that many top models such as GoPro have, and it gives you many video opportunities at a very reasonable price. 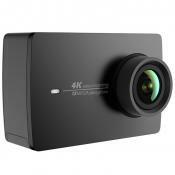 This camera allows you to capture 4K videos (3840x2160). However, take note that when shooting a blue streak in this resolution, an image might seem a bit blurred. That is because the picture frequency for this format is 25fps. So when you need to film objects that are moving very fast, we recommend you to select 1080P mode (1920x1080) with 60 fps. The image will be sharper, then. 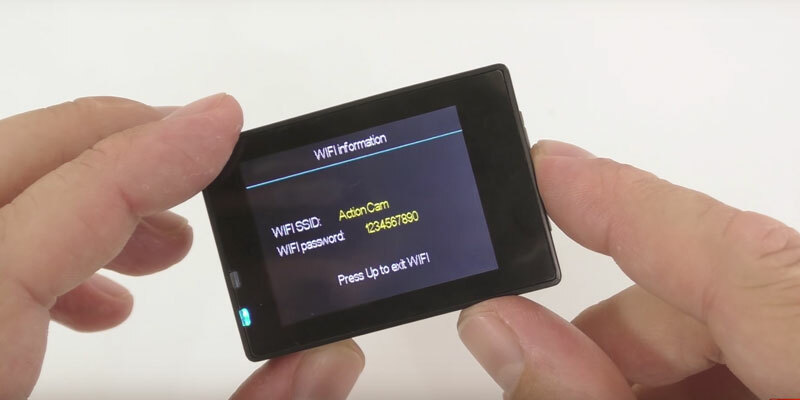 A built-in Wi-Fi module is another advantage of Akaso. 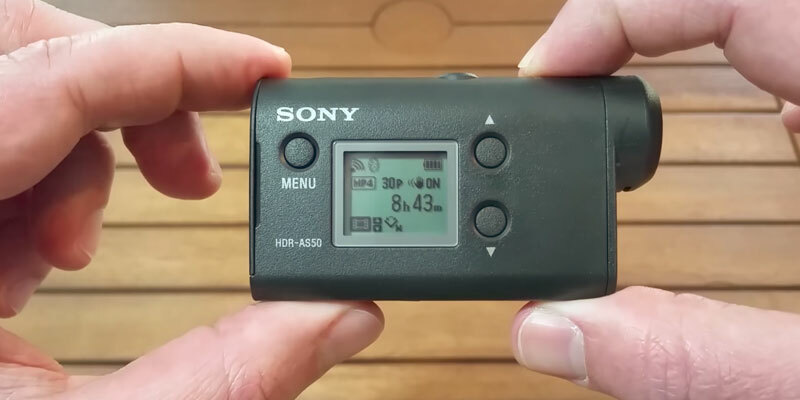 It allows for the wireless setting of video parameters. Plus, all the videos and footage will go to your phone immediately so that you can look them through. In order to optimise this process, you will just need to install iSmart DV on your smartphone or tablet. It works well on both Android and iOs. So it will take just a few minutes to get full access to your materials via your gadget. By the way, you can control you 4K cam via Wi-Fi at a 10-15m distance. That also expands your options a lot. Since there are many different mount accessories, and Akaso is compatible with most of the GoPro mounts, you can get the most of your sports cam installing it in the most convenient way. You will also find a waterproof case in the box. 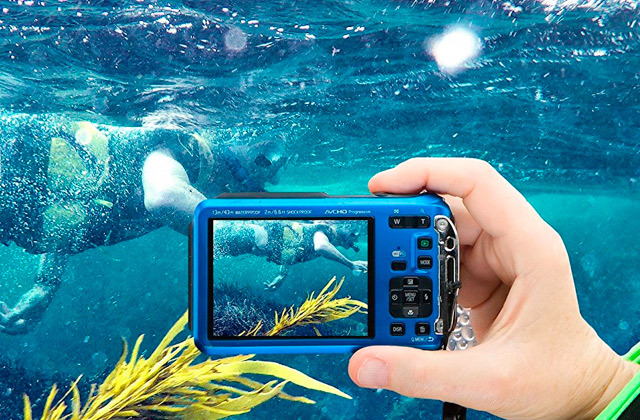 With its help, you will be able to capture underwater videos at the depth of up to 98 feet (30m). In other words, this high-class camera is a must-have for adventurers and any other enthusiasts who want to catch all special moments. Indeed, the Akaso EK7000 is a real bargain. 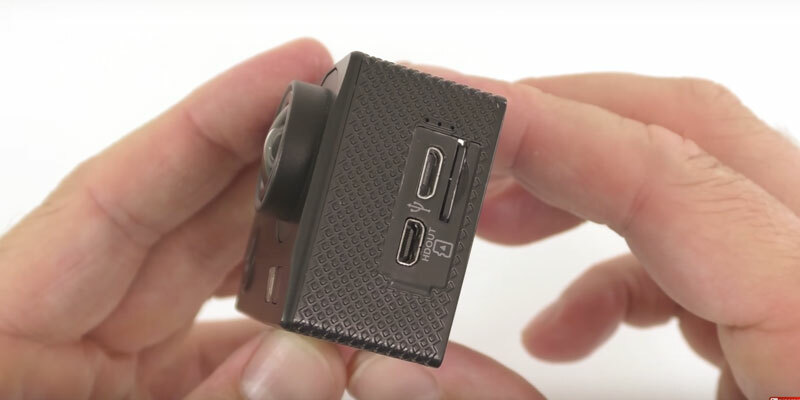 This 4K action camera comes with a 2.4G remote controller. 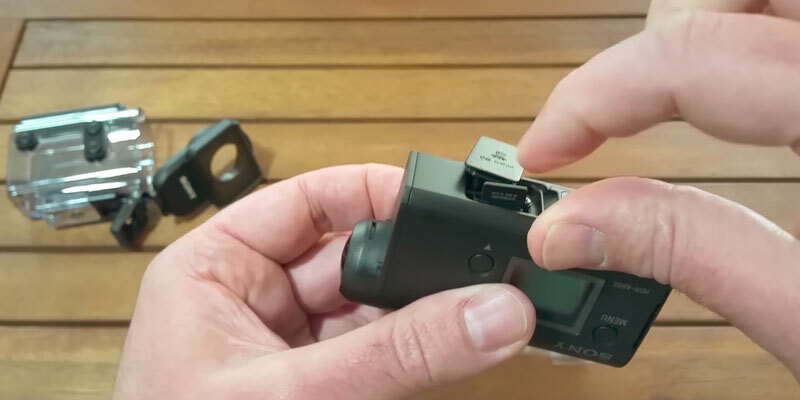 You can fix it around your wrist and command your Akaso camera at a distance. There are several buttons on the controller to start/stop video or photo shooting. You will notice that not all models have such a useful option. 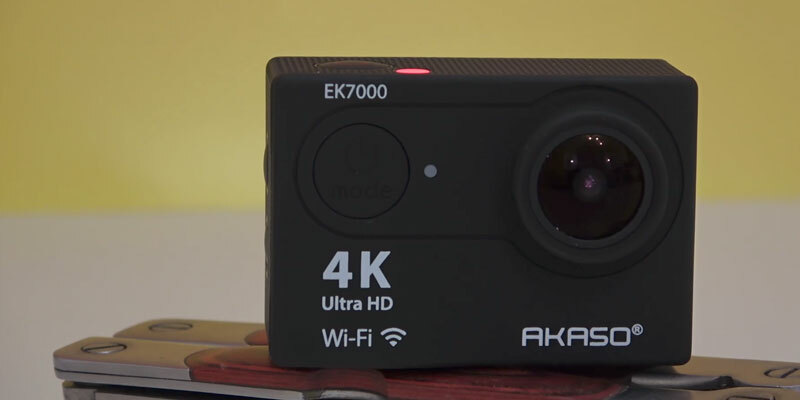 Akaso EK7000 action camera requires a 1050 mAh battery which allows for continuous operation for up to 90 minutes. However, you are not limited to this time. Since it comes with an extra battery in the box, you can double your shooting time and capture more special moments. 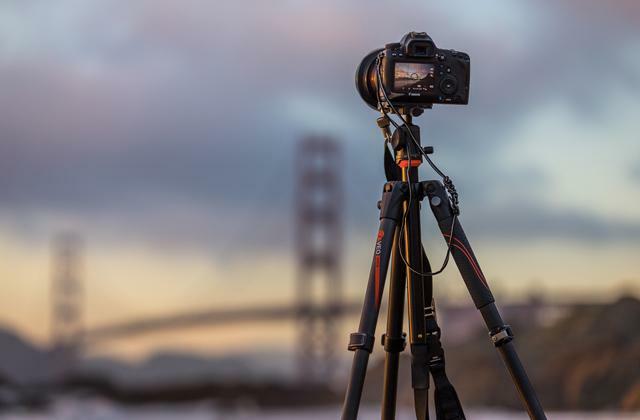 If you like to capture the night life of your city, for instance, the Time Lapse mode will be a pot of gold for you. You can edit a photo/video easily since images are made with 0.5 - 60 seconds interval. And in case you'd like to make videos in slow motion, use the 720p mode that records at 120fps. 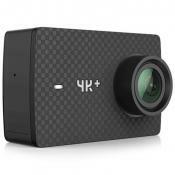 Unfortunately, most action cameras nowadays that make highly detailed Ultra HD videos are quite expensive. Still, there are a few that will offer you this option for a lower price, and the Campark ACT74 is one of that kind. Despite its moderate price, this 4K camera has quite impressive features. It has a 4K resolution (3840x2160) with 30 fps. The image is super detailed and clear without any image noise or blurring. If you select HD mode (1280x720), the maximal picture frequency will be 90 fps. This option allows you to take a photo of those objects that move very fast and they still will be clear. The camera is equipped with Sony IMX179 - a photosensitive image sensor that is quite good and maintains high-quality footage even under low light shooting conditions. Another advantage of this action cam is its ultra wide angle lens (170°). Due to this feature, the image in your photos and videos will be full and rich. 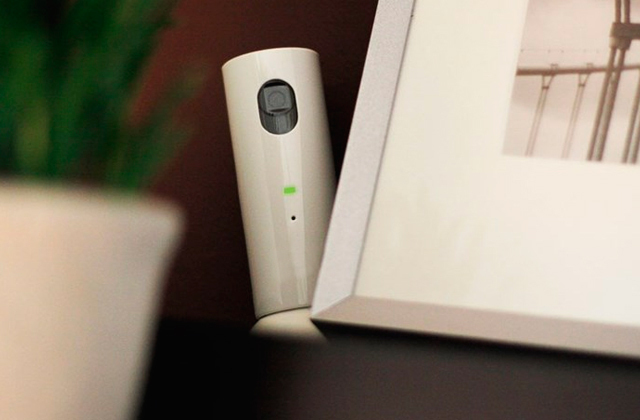 There is also a built-in Wi-Fi module, so you can control your camera remotely and run through video footage via your smartphone or tablet. All you need to do for that is install a specialised app. And that are not all useful options that Campark offers you. 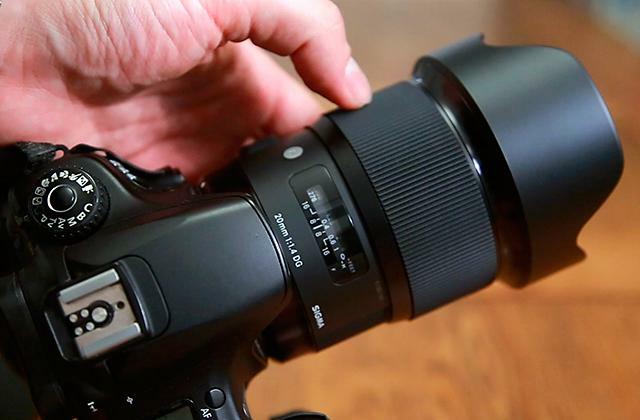 You can also connect it to your TV via HDMI cable to edit videos on a big screen when you want to look closer at each detail. 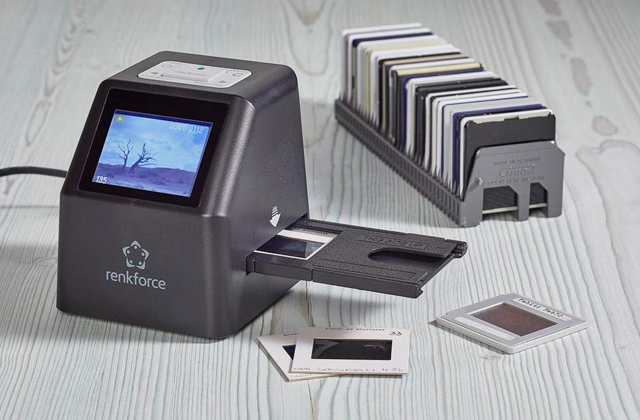 Besides, all the photo and video materials are stored on a Micro-SD flash card with the maximal storage space of 64 GB. It is not included in the box, but such cards are available in any electronic store and are reasonably priced. 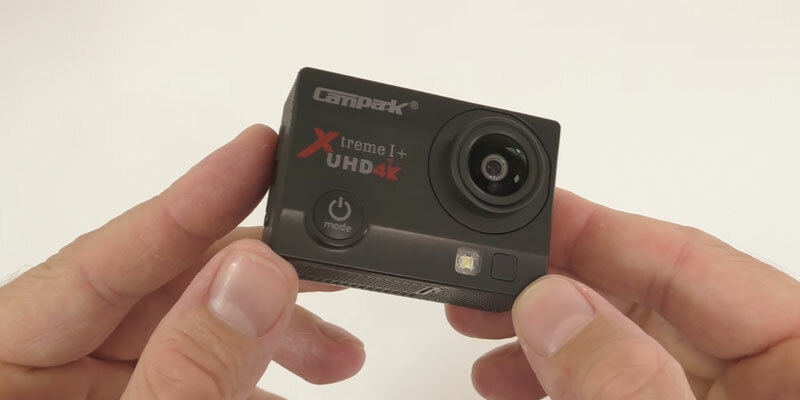 In other words, the Campark ACT74 is one of the best 4K action cameras that not only gives you as a whole an image as most of the leading models do but also saves you money. 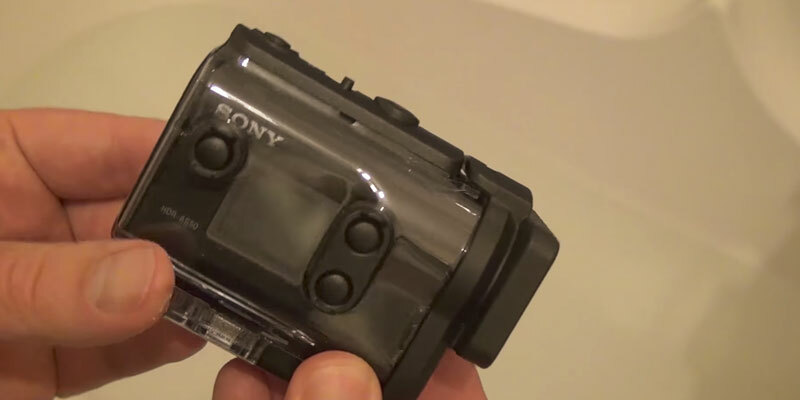 This sports cam can make both 4K videos and super clear 16 MP photos. In this respect, the image is colourful and bright. 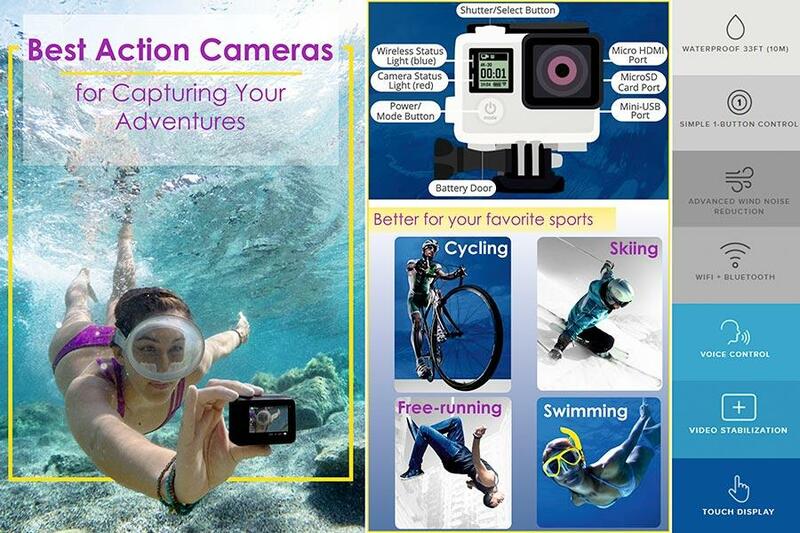 Plus, you can use it not only as an action camera but also as a digital cam. 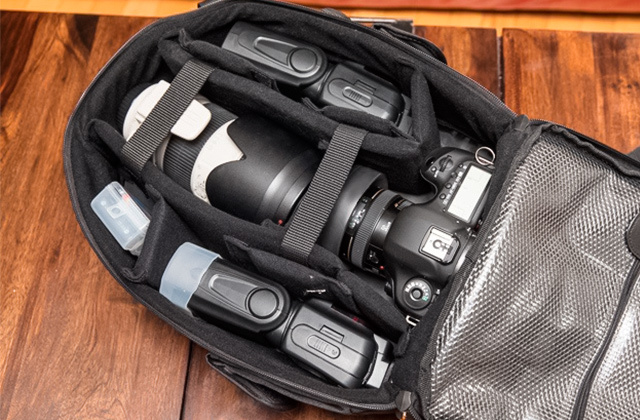 There is a protective bag for your camera and its accessories, which you'll find in the box. 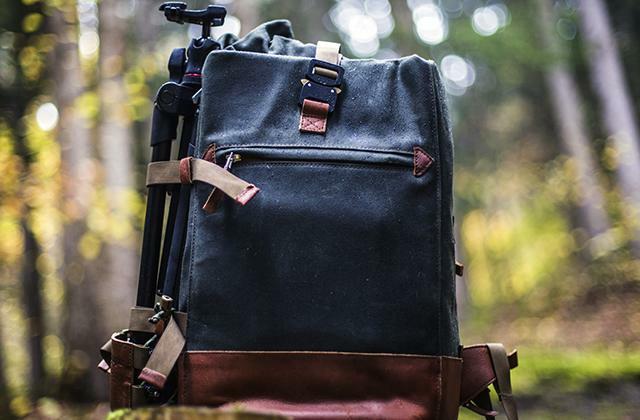 It guarantees your filming equipment safe keeping when you don't use the camera and it will help protect the camera from scratches or other damage. 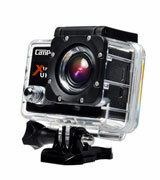 Plus, Campark comes with a waterproof case that allows diving with the camera up to 98 ft. So if you are a surfer or a diver, this model will help you make breathtaking videos. The Campark ACT74 operates off dual rechargeable lithium batteries, the maximal operation time of which is 90 minutes. However, you can extend the operation time of your camera on one charge, you just need to turn Auto Power function on. Plus, you can adjust it so that the camera will turn off after 1, 3, or 5 minutes of no operation. 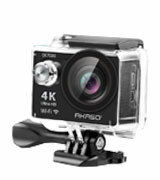 This action camera is a sports series cam that due to its unusual design is ideal for mounting on a helmet or a head. That is because it has an oblong cylindrical shape in contrast to its competitors that usually are square. As for video format, you can capture AVI videos, so you aren't likely to have any difficulties with editing and running through your captured material since you can do it practically with any device. The maximal resolution, at the same time, is 1920x1080 with 30 fps. 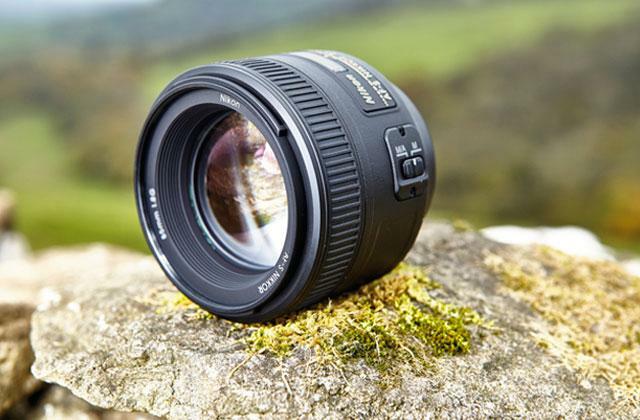 In case you want to shoot in higher picture frequency (60fps), you should select the 720P format (1280x720). Moreover, it makes quite good 1080P photos. 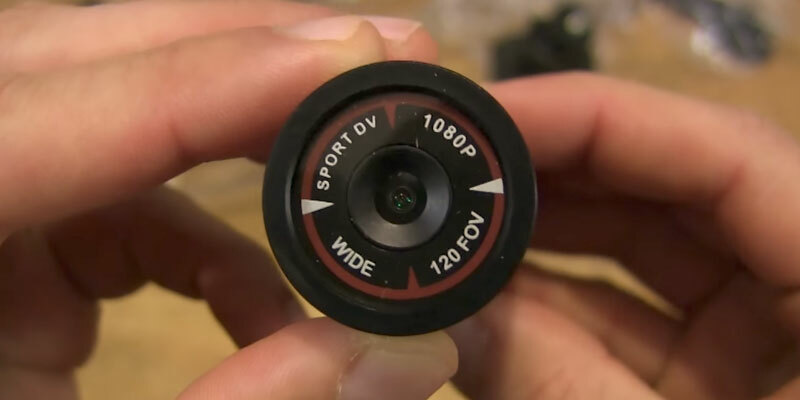 The object lens of this sports camera is wide-angled with 120° angle view. 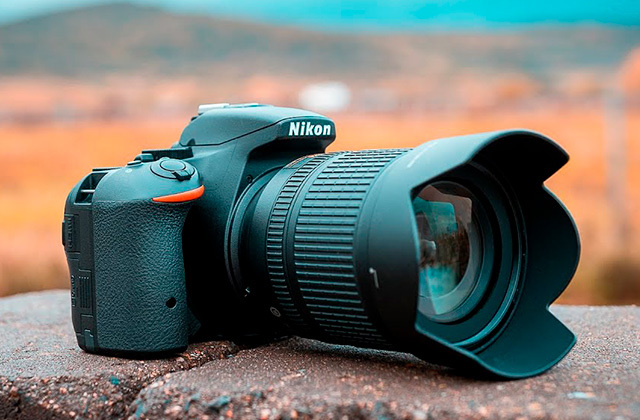 It is less than some other models have but accounting for the dimensions of this sports camera and its usability this angle is wide enough to get a wide-screen image. As we have mentioned, the Sfun SSC001 is a very space saving model that will fit any hand. Without a doubt, that is its big advantage. As to its power supply, it operates off an inbuilt battery. Unfortunately, you can't replace it when its charge is low. 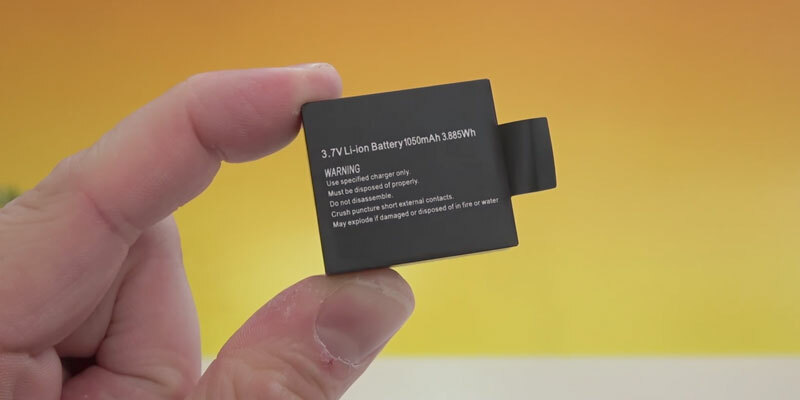 However, it works for 1-2 hours on one charge that is twice as long as other similar models offer you. Plus, this time length is more likely enough for full value shooting. Also, there is a protective cap on the back of the camera. It covers the Micro-USB joint designed to connect the camera to your PC or charger, and a Micro-SD slot that allows you to expand memory up to 32 GB. In view of the above, not only the Sfun SSC001 is pocket sized and convenient to mount, it will make you pro-quality videos and pictures with ease. The Sfun SSC001 model is designed to be easily mounted on a helmet. 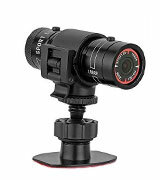 Consequently, in order to make the operation more convenient, the manufacturer has equipped this model with a vibration motor that starts working when the camera turns on and starts shooting, thus informing you about that. 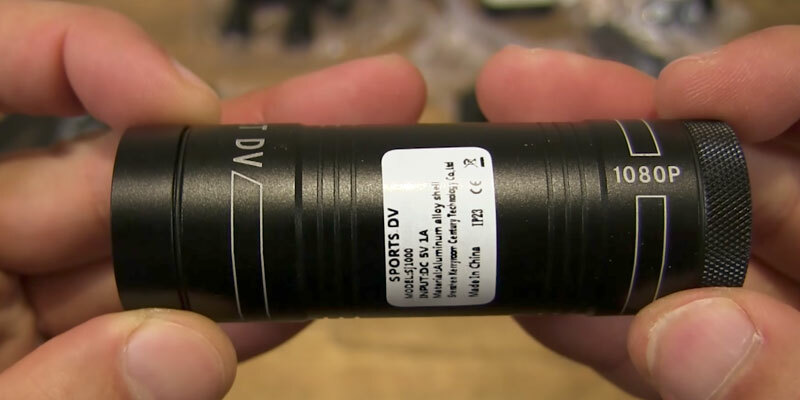 So there will be no need for you to take your sports cam off all the time to make sure it has started shooting. Would you like to capture your special events not only at daytime but also in the evening or make a romantic video at sunset on the beach? Anyway, this all is possible with Sfun SSC001. Thanks to 1/4" photosensitive element that is also low noise, the images come very clear and bright even under poor lighting. The Sfun SSC001 is made of aluminium alloy, so it is very durable and secured from possible damage. Not every model can offer such a good housing. However, despite the fact that it has a waterproof design and water spray resistance, you should avoid immediate contact of your cam with water. 1. 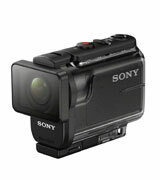 Eric Angevine How to Choose an Action Camcorder, Crutchfield. 2. 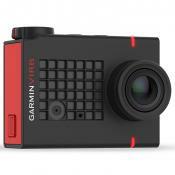 How to Choose an Action Camera, Eastern Mountain Sports. 3. 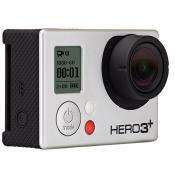 Ryan Shaw How to Buy the Best Action Camera, Which? 4. Action Camera Buying Guide, Boys' Life. 5. 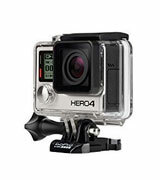 How to Choose a Great Underwater Camera, SwimOutlet. 6. 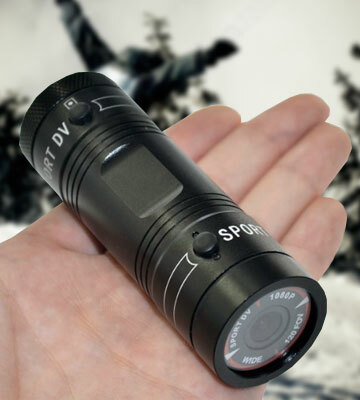 David Nield The Best Wearable Action Cameras for Extreme Sports and More, Wareable. June 7, 2016. 7. Dan Havlik Camera Buying Guide, Tom's Guide. April 28, 2016. 8. Brent Rose, Mike Perlman The Best Action Camera, The Wirecutter. August 1, 2016. 9. 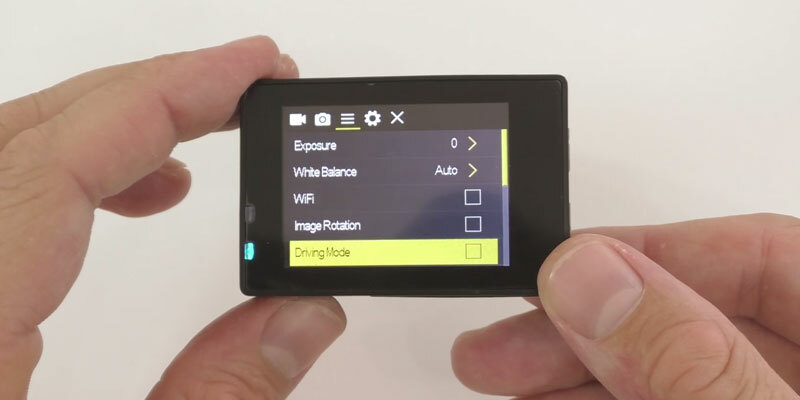 Richard Easton How to choose an SD card - class and speed ratings explained, Expert Reviews. February 11, 2016. 10. 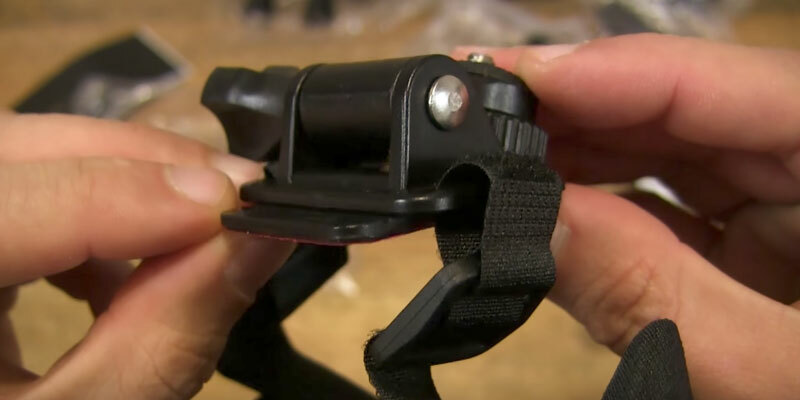 W. H. Bourne Action cam accessories buying guide, Videomaker Inc. April 20, 2015.